Menelik invited Leontiev to return to Ethiopia with a Russian military mission. 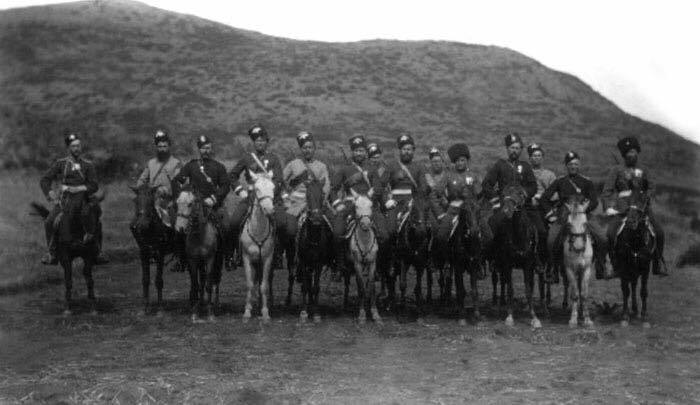 In 1895 Leontiev organized a delivery of Russian weapons for Ethiopia: 30,000 rifles, 5,000,000 cartridges, 5000 sabres, and a few cannons. The presence of the Russian advisers at the battle of Adwa helped the Ethiopians achieve victory in the first Italo-Ethiopian War. The Russian advisor Leonid Artamonov wrote that the Ethiopian artillery comprised 42 Russian mountain guns supported by a team of fifteen advisers. This is very interesting. I have been reviewing and studying WWI and the assassination of the Tzar Nocolai Romanov II, whose alleged family ruled the Empire of Russia for approximately 1000 years. In 1918 the Tzar and his entire family were assassinated. Now, I further looked into why that occurred, especially since Russia was right on the verge of winning the war against Germany. I looked into who funded the uprising Bolsheviks and not surprisingly found that Germany, England and the United States funded the entire revolt..
Of course this led to the fall of the Russian Empire and the implementation of Communism with Lenin as their leader and the creation of the USSR. What I find most interesting about this tid bit of information that I have found on your post is that some time ago while researching the indigenous history of America I was led to Ethiopia’s Empire. I found information wherein it discussed the wars Ethiopia had endured with the Europeans and this particular war with Italy was mentioned, which they won in 1896, but the source mentioned nothing of Russia’s assistance. So, I mention this because, there has been a reoccurring curiosity concerning the Truth that exist about the relationship between Russia and Ethiopia. Pushkin , and others like… Had link with Ethiopia , some of Russian great men came from Africa, notice Russia just erased Africa debts.